Forget death, taxes and porta potties, last winter the great equalizer throughout the state of Maine seemed to be the ice dam. From Fort Kent to the Foresides, from Calais to Casco and Cape Elizabeth, it seemed that no matter where you lived, how big or how expensive your home was, everyone fell victim to these potentially dangerous, damaging rooftop menaces. As the snow continued to fall across the state, homes and businesses scrambled to have their roofs raked off and solid ridges of as much as a foot of ice removed from their edges. It seems that until ice dams actually cause serious damage—roofs start leaking, ceilings fall in and rooms get ruined—as soon as the warm weather returns, homeowners forget about them until the next blizzard dumps a foot of snow on their homes again. Hopefully, this winter, more Mainers will be able to save themselves some worry—and money—by solving the ice dam problem before it has a chance to start. Because, after all, this IS Maine—it WILL snow again. Another mistake that homeowners assume is that ice dams are created because there is a problem with their roofs. Come spring, they’ll call a roofing company to come and replace shingles, or maybe even the waterlogged plywood sheathing underneath. If the roofing contractor simply does as the homeowner requested—and some will—the same thing will happen again. The reality is that although ice dams are found on roofs, the roof itself is rarely the primary cause of the problem. For that, you need to peel back the shingles, house wrap and sheathing and look at what lies beneath your roof—your attic. Unlike ice in your refrigerator or on a lake, ice dams are made from heat—not cold. No, this isn’t another one of those clever “how do they cook an ice cream cake?” type riddles. The ice that develops into an ice dam doesn’t just fall from the sky, roll down the slope of your roof and then decide to stop right before it falls off the edge. Instead, ice dams are a result of warm air from inside your home leaking up into the attic, heating the underside of the roof and causing the snow on the outside to melt. As the snow melts from the bottom it then almost immediately freezes from the cold outside temperatures. What results is a perpetual, self-sustaining system of melting and freezing that builds upon itself vertically. On its own, the dam isn’t the problem. Its weight can be significant, but not enough to do any damage. Instead, it’s the damming action that the solid ridge of ice creates that leads to problems. As normal conditions such as rising outdoor temperatures and solar radiation begin to melt the snow, the water travels down from the peak of the roof toward the ground. When the water heads down, it is stopped in its tracks by the ice dam, not only speeding up its growth when the temperature falls overnight, but eventually backing up under the shingles, seeping through the wood sheathing below and into your home. Since snow is a fact of life here in Maine, builders and homeowners can and should take steps to better insulate the areas of their attics and crawlspaces in order to keep warm air from being able to escape into unconditioned spaces. Remember the McDLT? Keep the cold side cold and the hot side hot. Creating a strong, consistent barrier between the warm air that’s inside your living area and creating an open space that stays as close to the outdoor temperature as possible will ensure that whatever snow lands on your roof will stay that way, until it (slowly) melts and falls safely to the ground. If ice dams caused you to lose sleep last winter, now is the time to do something about it. Remember, roof rakes, heat coils and metal flashing are only treating the symptoms, not the cause. When temperatures cool, get up into your attic (or call an insulation pro) and seal, baby seal. You’ll feel the benefits all year long. The more heat you can prevent from entering your attic this winter will also help keep it from entering into your home next summer, too. Tim King is a sustainability and energy efficiency writer based in Scarborough, Maine. 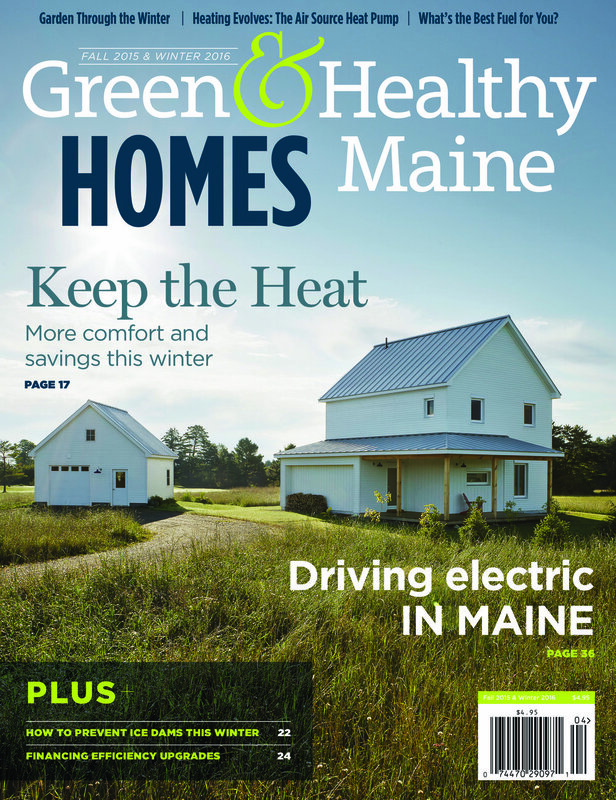 This article is reprinted from the fall 2015 issue of Green & Healthy Maine Homes. Subscribe today!